As markets are all flooded with supply of designer interior ensembles, it is quite a task to select the one that would fit right with your home décor. But this is also a sweet dilemma that homemakers like to experience as this gives them opportunity to select the best of tablecloth online from swayam India. 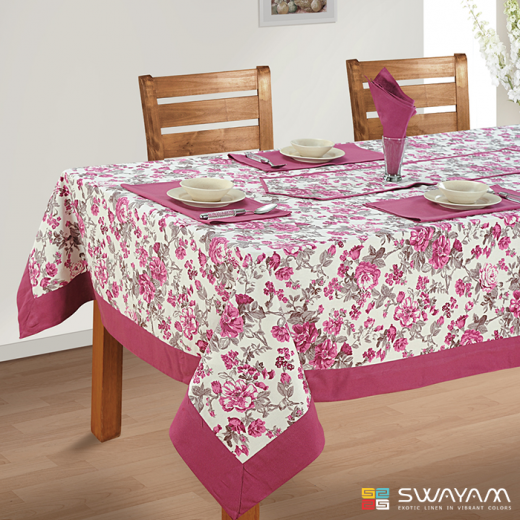 Swayam India endows a right mix of table linens that are diverse in design, shape and size. Each set is designed in a manner that would look after the needs and requirements of every customer. The use of traditional, modern and innovative patterns would help customers to select the linens from diverse collection. The prominent use of floral, block prints in paisley, and buti & folk art helps to present a traditional and rich look to living room ambiance. The check, stripes, solid colors, waves, speckles and swirl help present a contemporary and classy appearance to the setup. Collection is also available in fusion theme linens. They are a combination of patterns that have traditional and contemporary theme blended wonderfully to create an all-together unique look to the interiors. In this way, the guest would be able to enjoy the old charm of traditional essence and also pleasing youngsters with its trendy looks. The use of rich hues is an evident in traditional theme linens. The prime colors like red, orange, yellow, green and blue add a dose of liveliness and grandness to the dinner table set. Meanwhile the patterns inked in shades of white, lotus cream, beige, brown and other classy shades exude a modern, elegant and sophisticated vibe to the living room ambiance. The linens are available in shapes of square, rectangle and circles. The shapes of the dining table cover in India are available as per the size of the room and nature of occasion at Swayam. They also determine the size of the sitting arrangement.